If you’re looking for FUN ways to teach kids about germs, you’ve come to the right place! While the start of a new school year leaves me feeling giddy with excitement over the routine, structure, and discipline it brings along with it, I’m not a fan of all of the sicknesses that come with having a school-aged child. From runny noses, sore throats, and coughs, to ear infections and mysterious fevers, to stomach bugs (OMG, the stomach bugs! ), I always feel like I’m walking on egg shells from September through June wondering when the next illness is going to take us down. And while I try my hardest to keep my germ paranoia at bay for the sake of my 7-year-old so she won’t grow up with the same obsessive tendencies surrounding sicknesses that I’ve battled for most of my life, I often feel pulled in 2 very different directions. The logical part of my brain knows that exposure to germs and illnesses are important in helping my child develop a strong immune system, but there are only so many days I can spend cooped up inside cleaning up snot, phlegm, and vomit, you know? The good news is that my daughter has reached an age where I feel like I can reason with her on a deeper level rather than simply barking orders at her. I’ve always been diligent about reinforcing the importance of proper handwashing both at home and while we’re out and about, but lately I’ve noticed that the cause-effect relationship between poor hygiene and illness is starting to sink in. So I’ve decided it’s time to take things a step further, and while researching ‘how to teach kids about germs’ on Google and Pinterest, I found some pretty fun activities and lesson plans to educate kids on the different types of germs we come into contact with each day, and why proper handwashing is so important. Whether you’re a teacher, parent, caregiver, or obsessive germaphobe like me, I hope these tips and activities prove useful to you as you navigate your way through another cold and flu season! Before we get to the fun stuff, let’s take a deeper dive into the (not so) wonderful world of germs so we can better explain what they are and why we need to be cognizant of them to our kids. Simply put, germs are teeny tiny living organisms that can get into our bodies and make us sick when we don’t exercise proper hygiene. While we can’t see them with our eyes, germs can spread from our saliva when we sneeze or cough without covering our noses and our mouths – or when we sneeze or cough into our hands and don’t wash them properly afterwards – and they can also be spread through our sweat and blood. Germs can make us sick with all kinds of different illnesses. They can cause mild sicknesses like coughs and colds, and they can also cause more serious infections like strep throat, tonsillitis, and pneumonia that won’t go away without medication. Germs can also cause us to develop stomach bugs, which are NOT fun! What Is It Important to Teach Kids About Germs? I was one of the last of my friends to have children, and while my daughter is only ~5 years younger than the other kids in our social circle, I often find there is a huge divide when it comes to the ‘teach kids about germs’ topic. While I’m all for teaching proper handwashing and reminding my sweet girl not to touch her eyes, nose, and mouth while we’re out and about, most of the other moms I know are much more relaxed when it comes to germs for kids. They often scoff at my helicopter ways and are quick to remind me that not all germs are bad, and that exposure is paramount to developing a healthy immune system. This last point really strikes a cord with me. While you may not have a friend or family member with a weakened immune system, there may be someone at your child’s school, in your office, on the subway, or at your local grocery store who does. When we work collectively to prevent the spread of germs and illnesses, we can help keep the incidence of seasonal flus and other serious illnesses and infections to a minimum. When I first started researching for this post, my intention was to provide a bunch of tips on how to teach kids about germs, with a few fun handwashing activities for preschoolers thrown in for good measure, but the more time I spent on Pinterest, the more I realized that the best way to teach kids about the different types of germs and why proper handwashing is so important is to skip the lecture and make it fun! 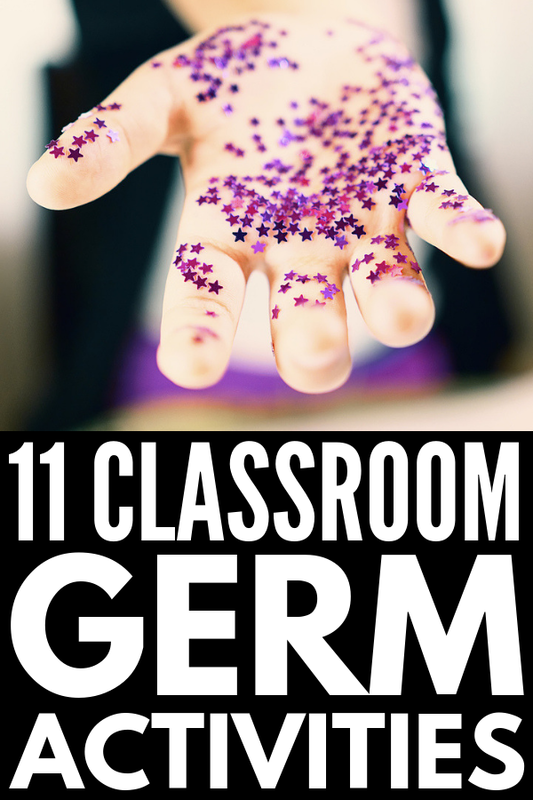 Here are 11 super fun ways to teach kids about germs both in the classroom and at home. This is probably one of the most popular handwashing activities for preschoolers on Pinterest, and for good reason. It’s a simple, fun, and effective way to visually demonstrate to small kids that rinsing our hands with water will not remove germs. We need to use soap too! To demonstrate this, add some glitter to a bowl of water, let your kids play around with the water, and then tell them to imagine the pieces of glitter that are stuck to their hands when they are finished playing are germs. Next, ask them to wash their hands only with water to see if the glitter comes off. When it doesn’t, ask them to wash their hands a second time using soap and ask them to count to 20 while they lather their hands before rinsing and drying off. The difference will be quite remarkable and will help them realize the importance of proper handwashing! If you’re not a fan of glitter (no judgment here! ), flour offers another way to teach kids about germs. Spread ¼ of a cup of flour on a plate and ask your students/children to place their hands firmly overtop of the flour while telling them to imagine the flour is actually germs. Next, provide them with a couple of easy-to-wash plastic or wooden toys (LEGO Duplo pieces, building blocks, etc.) for a few minutes, and then ask them to stop what they are doing and examine how much of the flour has transferred from their hands to the toys they are playing with. This is a great activity to visually demonstrate how easy it is for us to spread germs when we sneeze and cough into our hands and don’t wash them afterwards. This ‘experiment’ is another great way to teach kids about germs and the importance of using SOAP when washing our hands. Grab a large bowl and fill it ¾ of the way full with water and add a couple sprinkles of black pepper. You want a sufficient amount of pepper to be visible along the top of the water, but not so much that you can’t see the water. Next, add a couple drops of dish soap to the water using a dropper, and watch as the germs ‘run away’ from the soap and cling to the side of the bowl. Kids will find this REALLY cool, and the visual it provides will help them remember the importance of using soap to get rid of germs while washing their hands. I believe hand sanitizer will also work for this activity (I haven’t tried it yet), which may be helpful with kids who resist hand sanitizer while out and about! If you’re looking for ways to teach kids about germs in the classroom, this germ activity doubles as a fabulous (and fun) science experiment. Everything you need to re-create this experiment is included in this kit along with reading passages, writing response sheets, a proper handwashing poster, and a scientific method chart to be used for science fair projects. If you’re looking for an easy activity to teach kids about germs at home, this powdered donut experiment is where it’s at! We all know these delicious treats are equal parts delicious and messy, making them the perfect prop to teach kids why proper handwashing is so important. Hop on over to A Cotton Kandi Life to see how she turns this yummy treat into a fabulous learning experience! I realize I’ve already shared a ton of activities to teach kids about germs that are all pretty similar, but I wanted to include this one as well because I love how the combination of cinnamon and paper towels helps kids see that it’s not always as easy as we think to remove germs from our hands. Again, use caution with this exercise as you don’t want your children scrubbing their skin raw after they use the bathroom, blow their nose, or touch something icky, but definitely use this idea if your little one isn’t great at handwashing! If one or more of your students/children is notorious for coughing and/or sneezing without covering his or her nose and mouth, pom poms are a great way to visually show kids the impact this can have on their friends and family. Place a handful of pom poms in your hand and pretend to cough/sneeze, sending the pom poms flying in front of you. Tell your students/children to imagine that the pom poms represent germs, and ask them not to move them for the rest of the day so they can see not only how easily they spread, but also how long they can linger. While kind of gross, the internet is filled with all kinds of photos and YouTube clips of images and videos of germs, which some kids might find fascinating and exciting. In fact, this could make for a cool post-sickness discussion where you investigate what the germs that caused your child to become sick look like, and then brainstorm ideas on what can be done to prevent a similar sickness from occurring in the future. When my daughter was in preschool and the other moms and I were discussing all of the illness our sweet children kept bringing home, one of the women told us something I have never forgotten. She’s the mom of 3 kids, and said her middle child was taught by her preschool teacher many years ago to silently sing the Happy Birthday Song in her head while she lathers her hands with soap. Her other kids went to different preschools and never took to this skill as it wasn’t part of their daily routines, and she swears it’s the reason her middle daughter gets sick less frequently than her other children. Of course, you don’t have to stick to the Happy Birthday Song – just do a quick search for handwashing songs and you’ll find lots of great ideas! Another great way to teach kids about germs – and how easily they spread – is to create germ-themed blow paint art. Water down a bit of paint, dab a bit on a sheet of paper, and give your child a drinking straw to blow the paint around. You can decorate the germs you’ve created and give them names, and hanging them above the sink will help remind your students/children to spend time while washing their hands. Books are another simple, effective, and fun way to teach kids about germs, and there are HEAPS of great ones you can add to your library. Here are 6 of our favorites! What Are Germs and Why Do They Make You Sick? I hope this collection of tips and activities to teach kids about germs proves useful to you in helping you educate your students and/or children about the importance of proper handwashing during cold and flu season (and beyond). Remember to keep it fun and exercise common sense. While we want our children to practice good hand hygiene after using the bathroom, preparing food, touching animals, playing in the dirt, and/or coming into contact with someone who is sick, and also want to encourage them to take things a step further and keep germs contained by sneezing and coughing into their elbows, we don’t want them to become too focused on handwashing. It’s all about finding balance! If you liked this collection of ideas and activities to teach kids about germs, please share this post on Pinterest! And if you’re looking for more parenting tips and tricks, please follow our Parenting board where we share all kinds of fabulous ideas we share each day!